Making it on the TV series Shark Tank is to an entrepreneur what an Oscar is to an actor. It provides the high-profile notoriety that can propel you to bigger roles – and with all of the glitzy buzz that comes with capitalism and stardom. It is the ultimate reality show because entrepreneurs can strike it rich if they make the right deal with the right billionaire shark. Even aspiring entrepreneurs who don’t walk away with a deal on the show can reap great rewards, thanks to the exposure to millions of consumers. The show has the power to turn a sleepy, budding business into a hotbed of corporate profits. The show is loaded with great lessons to improve your sales pitch when selling projects or ideas; improve public speaking skills, effective communication skills, nonverbal skills, messaging skills, presentation skills, negotiating skills and more. Because of this, we use Shark Tank to build lively coaching sessions and workshops to help leaders and teams improve their influence with internal and external audiences. What many Shark Tank fans and viewers may not know is that for every entrepreneur that gets to pitch to the sharks, there are another 220 people that fail to make the cut. The show’s producers are not just looking for people with interesting products. They prefer people who are engaging and passionate – two very important presentation skills. This is why Shark Tank is such an excellent learning tool. Daily, you are honing your presentation skills and sales skills as you sell others on your ideas, products or projects. Whether you hit a home run or strike out, you should walk away from each meeting or presentation with greater knowledge and better strategies for the next time. It takes a winner’s mindset to reach your full potential. 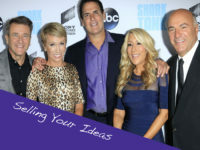 As shark and QVC Queen, Lori Greiner likes to say, “There are no ‘no’s,’ just ‘how can I?’” We have put together a few of our very favorite Shark Tank lessons to help you fine-tune your next project presentation or sales pitch. Kevin O’Leary, aka, Mr. Wonderful has earned the reputation as the boxer among the sharks. His communication style is purposely bold and combative. He uses this style to intimidate, so he can weed out weak entrepreneurs. O’Leary wants to see if contestants have the stamina to withstand his forceful style. Therefore, he comes at you straight on and if you do not meet his criteria (profits), he smells blood in the water and hits you with, “You are dead to me!” One of O’Leary’s biggest pet peeves is an entrepreneur who rambles during their presentation. You have 30 seconds to make a good, first impression, so your presentation messages must be targeted. To gain O’Leary’s respect and partnership, you must also be quick on your feet as he fires off questions and insults. On one hand, you better have some strong communication alignment skills. On the other hand, if you don’t engage in some communication boxing with Mr. Wonderful, he will not respect you. Clearly, it’s a delicate communication dance with this type of shark; only the best survive and go on to thrive with O’Leary as a business partner. Before you pitch ideas or projects at work, the golden rule is to know your audience and tailor your presentation to match their criteria and pre-identify possible objections. If you watch Shark Tank enough, you realize that each shark has core criteria that is most important to them – namely, profits and products that complement their business models. But, beyond profits, each shark has other key criteria that also influences their decisions about potential business partners. For example, Mark Cuban will shoot you down if you lack a true entrepreneurial spirit. He wants proof that you are fired up and passionate about your product – that you are in it to win. Shark and real estate mogul, Barbara Corcoran, places great value on personality and attitude. She walks away quickly if she thinks you have a difficult personality and could be a challenging business partner. Robert Herjavec is such a nice guy, but he walks away if he perceives glaring gaps in your numbers or overall presentation. With Herjavec, entrepreneurs had best reveal any “elephants in the room” early on. Recently, a contestant was touting her upscale, organic apple sauce. This woman exuded power in her speech and overall nonverbal presence. Although most of the sharks appeared to find her credible and liked her presentation style, they were dropping like flies and declining to make her an offer. Mr. Wonderful criticized her for not being willing to leave her full-time job as an HR leader for a major corporation. He said that meant she didn’t believe in her product. Cuban piled on and said he, too, questioned if she was hungry enough to be a successful entrepreneur. As the owner of the Dallas Mavericks and other groups, Cuban often tells the story about how he was broke before he got his big break. He has written books and told journalists during media interviews how he shared an apartment with five other guys and lived on macaroni and cheese. Alert! Listen carefully to the stories people share with you! They are telling you something very important about their core beliefs. Repeated stories provide a window into their psyches – so pay close attention to their stories. Stories are full of hidden gems with invaluable information that is key to how you relate to others and gain their trust! Now, the vast majority of the time crying gets you kicked out of the Shark Tank without a deal. However, when this apple sauce entrepreneur teared up over O’Leary and Cuban’s criticism, things quickly turned in her favor. She revealed her own story: as a black, female professional, she is the “one” in her family who has “made it.” She told the sharks that she is the sole bread-winner for her family and has put her entire life’s saving on the line to make this organic apple sauce business a success. While wiping tears from her face, she said it is the one thing she has ever done for herself. Cuban was hooked! Her story convinced him she was a good match for his deeply-held criteria – a risk-taker and fired up entrepreneur. She walked out of the Shark Tank with a deal in hand and a commitment from Cuban to put his team behind her brand. Selling your ideas and projects is a lot like cooking; a great chef knows that experimenting allows you to fine-tune a recipe to bring out the very best flavors and textures. Shark Tank lessons are also invaluable for helping you fine-tune how you read others and communicate with them to influence their thinking as you sell your projects and ideas. The show makes learning fun and helps you identify which strategies work and which ones fall flat. Not everyone is a natural presenter or stellar influencer, but with some tweaks here and there, you can truly transform your capabilities and success rate. You can swim with the sharks and enjoy new lessons about influencing and connecting with others. Contact Us & Schedule Your Shark Tank Session! At Benchmark Communications, we use Shark Tank to help teams and leaders greatly improve the effectiveness of their presentations and sales pitches. Some groups choose this for their New Years Kick Off Meetings. These information-packed sessions are fun, challenging and highly interactive. Your people will walk away with fresh strategies to help them create more targeted messaging, stronger presenting skills, awareness of their nonverbal cues, more robust sales pitches, strategies for overcoming objections and much more. Contact us today and schedule your own Shark Tank session.